Last week my family and I spent more than 15 hours on a round-trip Amtrak journey, our first major train ride together. Thanks to some simple planning, an above-average performance by Amtrak, and a little bit of luck, we had a pleasurable experience – one you and your brood can replicate if you keep the following tips in mind. Amtrak permits two carry-on bags per passenger, and our party of five managed to limit our packing to eight pieces – three wheelie bags for our clothes and a backpack for each of us. We pack similarly for air and car travel, but in this case we used extra-narrow wheelie bags – enabling us to more easily navigate the train aisles and shove the bags into the overhead racks. The backpacks also left the grown-ups and my daughters free hands to grab hold of my son at crowded moments. At New York Penn Station, trains board approximately 15 minutes before departure, and as soon as the track number is posted, riders jockey to reach the platform. This was the one part of the trip we were dreading, so we couldn’t have been more surprised when, shortly after planting ourselves in the Amtrak waiting area, a passing skycap said to us, “If you folks want to pre-board, let me know.” The news that pre-boarding was possible on Amtrak rendered me speechless, but my wife wasn’t similarly afflicted and said, “We’re letting you know,” before the skycap took another step. Before we knew it, we were escorted by elevator down to the blissfully deserted platform and led to our seats. According to our skycap, any Amtrak passenger – not just a family that looks like it can use a break – is entitled to pre-boarding. All you need do is ask. For about $30 above the cost of a reserved coach seat, business class is offered on selected Amtrak trains. We rode in business on our ride to Rochester (more on that destination next week) and sat in reserved coach on our ride home. Both business and coach offer reasonably wide and comfortable seats with decent legroom, leg rests that pop up from under the seats, tray tables, and two very handy 120v outlets per pair of seats. While the actual seats in business were slightly nicer – smooth leathery finish versus the fabric in coach – the real advantage to business class is the positioning of the car – it was the last car on the train, so the ride was virtually devoid of fellow passengers parading the aisles, as was the case on our return home. Another perk was that the business class car was not only connected to the dining car, but bottles of juice ($2.75) and water ($2.25) as well as coffee and hot chocolate ($2.00) were free, and my family easily consumed nearly $40 in beverages during that seven hour ride. Fortunately, the dining car bathroom was always free, too. Like our helpful skycap, the other Amtrak staff we encountered were service oriented. When my e-ticket disappeared the moment I needed to present it, the conductor let it slide, as he was able to punch up my reservation on his handheld device (though not before informing my wife that she should carry the tickets the next time). And the station agent in Rochester advised us to head toward the back of the train and to do it before the train arrived – not inside information per se, but helpful, as this advice put us at the front of a line of about 75 passengers waiting to board our train back to New York. Amtrak says in so many words that their free AmtrakConnect Wi-Fi service, available on selected trains, may be spotty. Unfortunately, we were unable to connect to the Wi-Fi at all on our various phones, tablets, and netbooks. This was disappointing, but it didn’t hamper our collective gadget usage much, as 3G was mostly available when we needed it. Plus, I had come bearing new travel games that I gave to each child once we were underway. So instead of relying on streaming video (a service Amtrak says is unavailable even when their Wi-Fi is working), we did what families are supposed to do on trains and played Hangman and Guess Who. Once I sat down and saw that the kids were entertaining themselves for a while, I got lost in a book until it dawned on me to look out the window. 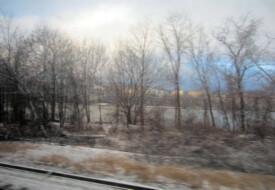 When I started to take it all in –the misty mountains, the tiny deserted marinas lightly blanketed with snow, and other vistas that are uniquely visible from the window of a moving train, I got the kids to stare out their windows rather than at their screens, at least part of the time. While there are no restrictions on bringing food aboard, the novelty of buying and eating dining car food just feels like it ought to be part of the family rail adventure. Microwavable pizza, burgers, sandwiches, salads, yogurt, candy, as well as wine, beer, and hard liquor are all available. The pre-packaged fare is exactly what you’d expect, as is the price – approximately $40 to feed a family of five, not including any soft drinks that may or may not be free, depending on your class of service. Those little cardboard trays they give you in the dining car are very handy for keeping your phone, camera, charger, and other personal items organized, especially since you can leave the tray on your open tray table and still have plenty of room to stretch your legs. While we tried to keep walking the aisles to a minimum, there’s nothing wrong with stretching your legs, especially when you have a six-year-old in tow. When my son discovered that smacking the vertical black rectangle (located where the handle would be) opened the sliding door of the train, he was delighted at the magic of this technology, and it brought back memories of smacking those connecting doors open when I rode Amtrak as a child.